Miley Cyrus has arrived and she is here to stay. 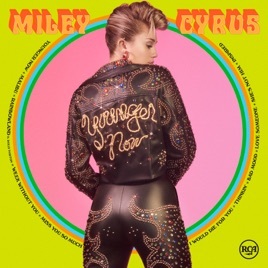 Younger Now (single) is a gorgeously arranged dance piece. Malibu, the viral first single, teleports you to a carefree day on a beach next to the love of your life, while Inspired offers hope to listeners of making a change in the current social climate. The entire album is self-wrote, and something very special is coming. Like most Miley Cyrus albums, this is the new her. Forget about everything you once knew, and allow Miss Cyrus to help you feel young again. 5 🌟 for Smiley Miley! Omg...Where do I begin? I have been following Miley Cyrus since her Hannah Montana days. I worshipped her when I was a little kid. I loved her first few albums. Yes, when Bangerz came out I was shocked about everything. But I came to enjoy this album. But this album...this is genuine 1,000,000% AMAZING. I love how this album embraces change. She seems so happy. It's great to see her finding her place in the world. I also adore the cover and I'm getting a total 80s vibe. Something like Madonna or Cyndi Lauper. I like how she is combining multiple genres into one album. Maybe she is creating her own genre? Anyways, this album is fantastic, but my complaint to iTunes is if I already bought the first two songs, why do I have to buy them again on pre-order?? ?